Hatriot is mostly known for being the new band of one of the original American thrash icons, Steve “Zetro” Souza. I don’t think he’ll need any introduction, but for those few readers who don’t know who the hell this fine fellow is the band names Exodus and Testament will say enough. Steve was the original Testament vocalist before Testament was even called Testament and he was the singer on quite a few Exodus albums. A guy who has earned his stripes. 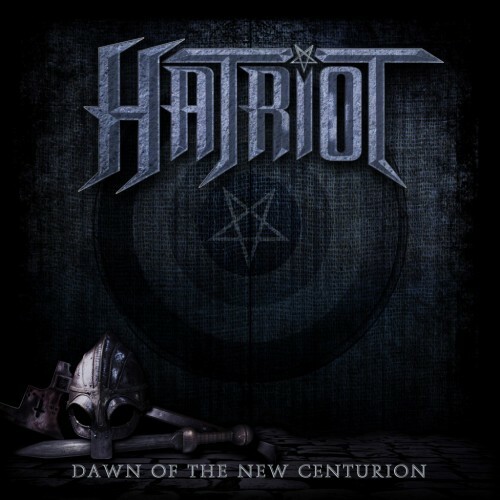 With Dawn Of The New Centurion he releases the second album of his new band Hatriot. Hatriot is a real family business with Cody and Nick Souza respectively on bass and drums. Heroes Of Origin, their debut, didn’t make a lasting impression on me, while other media outlets really raved about this thrash album. I was hopeful that I missed what all the fuzz was about and that Dawn Of The New Centurion would click with me. Unfortunately after numerous listens it still doesn’t. The main culprit is the big thrash icon himself. Never been a fan of his vocals and clearly I’ll never be one. His raspy barking vocal style just doesn’t do it for me. Together with the lack of tempo changes within and between songs it makes the songs boring and just not something that I would like to revisit too often. If it wasn’t mine duty to review this album and give it an extra few spins to really make the album sink in, I would have dispatched of it after just the first spin. Well and to be honest the album doesn’t even sink in. Hatriot has some moments on Dawn Of The New Centurion like the start after the intro in ‘In My Cold Dead Hands’, the nice up-tempo thrasher ‘World Funeral’ and the more dragging riffs (almost King Diamond like) in ‘Dawn Of The New Centurion’. But next to those highlights you get the painful backing vocals on a few songs, the really irritating high-hats in ‘Silence In The House Of The Lord’ and well the one-dimensional vocals of Zetro. The drums are also a bit too much in the front of the mix to my liking and it would be nicer if the guitars would be put a bit more upfront. Dawn Of The New Centurionfailed to impress me. Lately quite a few thrash albums have passed for review and they were almost all better and more interesting than this one. It bored me and that’s not a good sign. That the album doesn’t get a score below the 60 points line is because the songs aren’t that badly written and you can’t push it away as an awful thrash album, it just doesn’t stand out.